Four Swords was quite an extraordinary concept. I mean, a game with four Links, where you can link your Game Boy Advances together with friends and play together in a co-operative adventure. The idea sounded good, it just failed because of the technology back in those days. We all know that Nintendo is all for togetherness and playing together, hence the “Wii” and the wireless capabilities of the DS series, but a game like Four Swords just wasn’t meant for the Game Boy Advance. Whether Nintendo knew it or not, Four Swords has always been perfect for the upcoming 3DS. Few people have truly been able to experience what Four Swords is about. Some people only know because of YouTube, and too many have only played it due to illegal downloads. As for myself, all I’ve ever been able to do is watch the introduction sequence before you get to the connection jargon. It was a great bonus, or at least many of us thought, when we first saw that A Link to the Past was being released on the Advance bundled with a new adventure. It was such a shame when we discovered that we couldn’t play that adventure unless we somehow got multiple cartridges, consoles and link cables. Some people did, but most of us couldn’t and didn’t. It is not a new suggestion that the DS would be the perfect home for a Four Swords game. 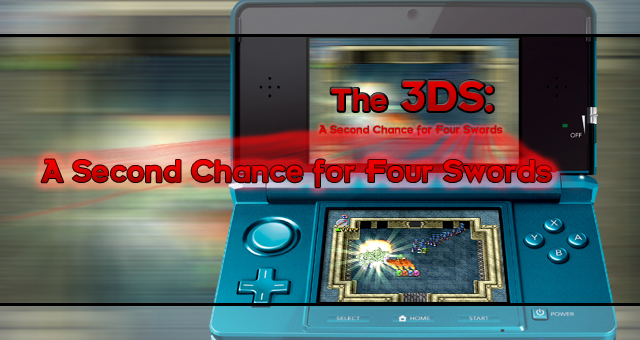 Ben Lamoreux suggested it in his article “Nintendo’s Missed Opportunity: Four Swords DS”. He wrote how a Four Swords game would suit the DS’s capabilities perfectly. It has easy wireless connectivity between players, but also the ability for download play, meaning that only one cartridge was required. Now that was about a generic Four Swords game for the DS; but now let’s consider how perfect the 3DS is for the original Four Swords game. The 3DS can do everything the DS could, with all of the wireless connectivity, but it has the added bonus of the virtual console. Already it is announced that fans can download and play Link’s Awakening on their 3DS amongst other Game Boy titles. Why not include Four Swords as one of them? Whether or not every player needs the software on their 3DS, it’s much easier to grab a quick download then to go to all of the effort and costs to hook up some Advances. The 3DS is a second chance for Four Swords. It is a platform that allows for us to be able to actually play it. I’ve missed out on the Four Swords experience so far, but now Nintendo can give it back to me, to you and to a whole new range of gamers. It’s not a big ask and I can really only see benefits, for both us gamers and Nintendo, if such a direction was taken. Let us hope that it is! Credit for giving me the idea of Four Swords as a downloadable 3DS title goes to ZI forum member Rae.